Travel Riga - Vilnius with ECOLINES buses. Comfortable seats, tablet - movies, music. WC, WiFi, 220V, drinks - coffee, tea. 3 free bags. To find out ticket price and bus schedule, please visit the sales system. Campaign valid from 18.04.2019 till 09.05.2019. Only for journeys from 18.05.2019 till 31.05.2019. Discount does not apply to route Riga - Vilnius at 22:25 and Vilnius - Riga at 02:40. Number of tickets with discount is limited (3 seats for bus). The applied discount does not allow to change date. For repeated date and time change rules are the same. Payment with ECO-bonuses is not possible. For online sale only! 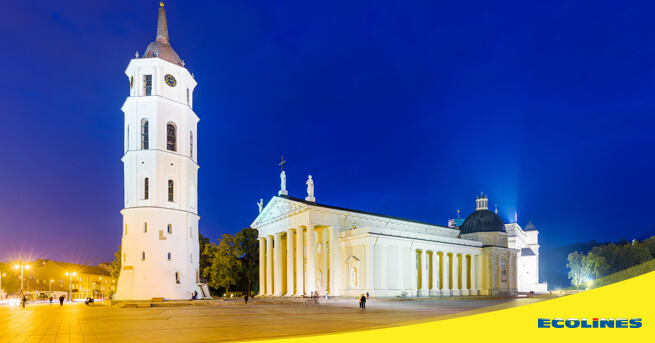 -Ticket price for bus Riga — Vilnius in sales system by selecting the date and time of travel. -Distance between cities Riga and Vilnius -295 km. -Average time on road in route Riga — Vilnius : 4 h 5 min. -Time difference between the cities Riga and Vilnius - 0 hours. You can save your time and buy ticket for bus Riga — Vilnius online or in one of our offices. When buying a ticket online you have to choose the route, departure date, number of passengers and click "Search". In the same way you can check seat availability on the route Riga — Vilnius . Buying a ticket for bus Riga — Vilnius is possible in 8 different currencies: EUR, PLN, BGN, RUB, UAH, GBP, CZK, BYN. In order to buy a ticket for bus Riga — Vilnius cheaper or get it for free in the future, sign up for our loyalty system.